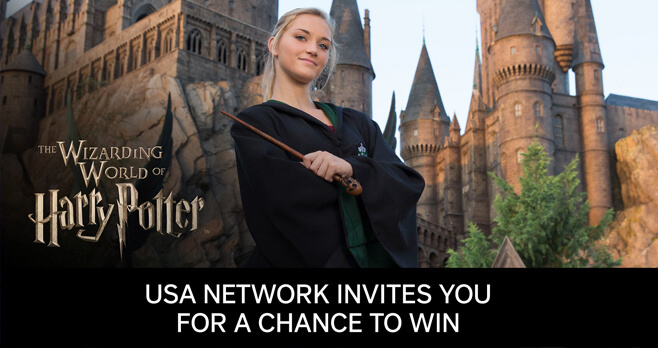 USA Network is giving you the chance to win a family trip to next year’s Christmas in the Wizarding World of Harry Potter at Universal Parks & Resorts with the Universal Studios Sweepstakes 2017. Enter now through December 24.
Who Can Enter? The USA Christmas in The Wizarding World of Harry Potter Sweepstakes is open only to permanent, legal United States residents who are physically residing in one of the 50 United States or the District of Columbia (excluding Puerto Rico, Guam, the Virgin Islands and other United States territories), and who are 18 years of age or older and of the age of majority in their state of residence as of the start of the Sweepstakes Period. When To Enter? Sweepstakes begins on December 18, 2017 at 12:00 A.M. ET and ends on December, 24, 2017 at 11:59 P.M. ET. What Is The Universal Studios Sweepstakes Prize? The Grand Prize consists of a trip for four to either Universal Orlando Resort in Orlando, Florida or Universal Studios Hollywood in Hollywood, California. Who Are The USA Network Sweepstakes Winners? For the name of the Winner, available after January 5, 2018, send a self-addressed, stamped envelope to be received by March 5, 2018 to USA/SYFY Christmas in The Wizarding World of Harry Potter Sweepstakes 30 Rockefeller Plaza New York, NY 10112 Attn: Lauren Roberts.